Latest addition – Mopane arrives! 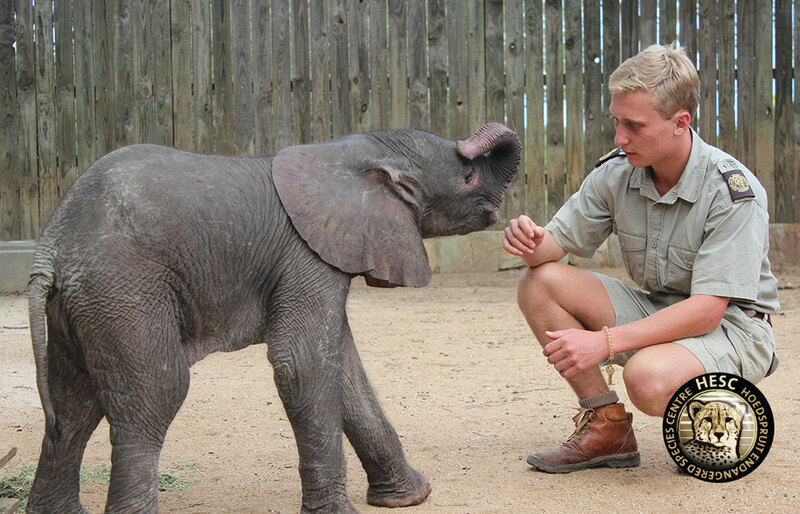 The Hoedspruit Endangered Species Centre (HESC) received a call that a little baby elephant was found wandering on his own in the Kruger National Park, close to Phalaborwa. Karien Keet, the warden, was notified and a plan to rescue him was put into action. 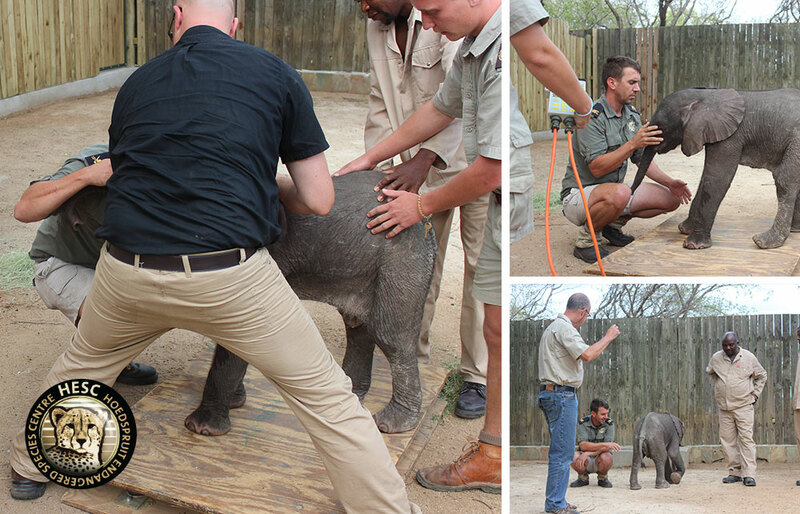 They found the elephant to be dehydrated and thirsty but on 8 December the 3-4 week old baby arrived. While on the way to HESC he was named Mopane, referring to the tree that grows in arid regions of South Africa. The leaves of the tree are bitter – much like Mopane’s situation – and are shaped like butterfly wings, parallel to what HESC plans for this little baby: to give him wings and confidence to grow. Upon his arrival, the HESC team and veterinarian, Dr Rogers, were ready to receive him. Fortunately, he had been drinking a little bit of water on the trip to HESC. Mopane could then be weighed and came in at 78 kg. Dr Rogers then attached drips for hydration and sustenance. Closer inspection of Mopane established that his belly button was infected which meant he had to be sedated for it to be cleaned. Dr Rogers also found that Mopane was not really putting pressure on his back-right foot. The assumption was made that he must have injured it. When the inspection was done Mopane was woken up and left in the hands of the curators as the drips continued to supply much needed hydration. The first night was difficult. Mopane did not take to the bottle immediately. 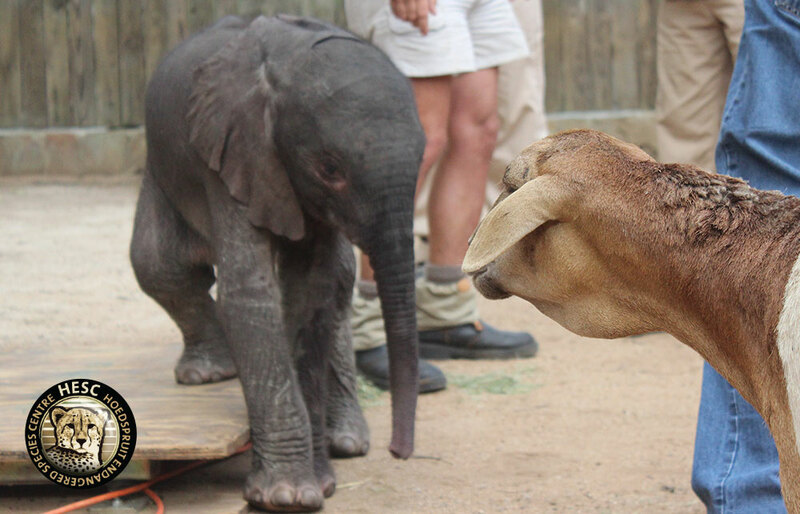 Baby elephants and bottle feedings are challenging: no two elephants drink the same milk. What worked for Shawu would not necessarily work for Mopane. Upon the arrival of the next day Mopane’s drinking was still not up to scratch. Dr Rogers was brought in again to administer more drips and to inspect the infected naval. By the following day Mopane made great strides and started to drink his milk formulae. Although this is an extremely good step in the right direction, it is still early days for little Mopane and the HESC team are working around the clock to pull him through. Please keep an eye out on his updates in the next couple of days. ** Since Shawu is doing very well, it was decided that Lammie should look after Mopane until he is settled. AGAIN, THANKS TO ALL OF YOU FOR THE WONDERFUL WORK YOU PEOPLE IS DOING !!!!!!! Good to know Lammie is on the case. Hoping Lammie is feeling better too. I know Mopane will be in great hands with Lammie, Dr. Rogers, and the entire HESC staff. My heart goes out to this very special boy. oh poor baby we will pray for him and give thanks to those who watch over Mopane. I am so happy to read about Mopane and am wishing for his continued progress. I met Shawu last March, am coming back next March. Looking forward to seeing Shawu again and hope to meet Mopane. Good luck with his progress!! When are we able to watch the live cam at the boma ? Have a nice week-end and merry christmas for all ! Good day Bernie. Thank you for your comment. We are tirelessly working on getting the camera up and running and will keep you posted!